First question: What is as mealy as ex-Polish foreign minister Radoslaw Sikorski but not as tart as his wife, American journalist and Russia-hater Anne Applebaum? Answer: the Polish apple scam. Second question: What has more worms in it than the Polish apple scam? That’s the Russian apple scam. On August 7, 2014, Russia imposed counter-sanctions on food imports from the European Union (EU) and several other countries which had already imposed sanctions on Russia after the putsch in Kiev triggered the secession of Crimea and began the civil war in eastern Ukraine. At the time, Poland was the largest supplier of apples to Russian consumers. 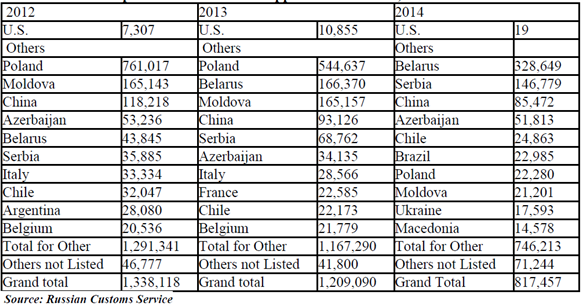 They comprised more than half of all Polish exports, and the same fraction of all apple imports to Russia. Because imported apples comprise roughly two-thirds of Russian consumption, Polish apples were popping into Russian mouths at a rate of one fruit out of every three. 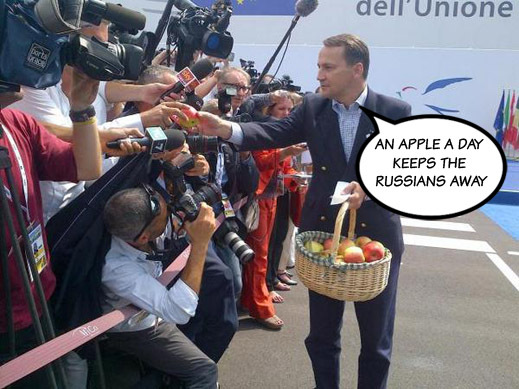 For a repeat of Sikorski’s Eat Putin-Eat a Polish apple line in Milan, watch this. For analysis of the impact of the Russian sanctions on the EU food trade, click to read. Almost three years have now elapsed. Under investigation for a variety of offences – they include disclosing official secrets when his mouth was full of taxpayer-paid food at a Warsaw restaurant — Sikorski was forced out of the foreign ministry and then from the post of Speaker of the Polish Sejm (parliament). He is employed now in the US. He and his wife, Anne Applebaum (“apple tree” is her Jewish surname following the 1787 decree of the Austro-Hungarian Emperor Joseph II), continue to campaign for tougher sanctions, NATO military operations against Russia, and regime change in Moscow. Left: Sikorski at home with books; right: Applebaum at home with beets. The initial estimates were that the Russian ban on Polish apple imports would cost Poland several hundred million euros or dollars. But that was assuming all Polish apples would stop being sold to Russia. In 2013 Polish apple exports to Russia were reportedly worth $341 million (€256 million); in 2014 the sales value grew to just over $400 million. In 2015 Polish exporters told reporters their sales to Russia had been slashed by more than a third. Officially, according to the Russian Customs figures, that’s what happened. In 2013, Polish apple imports to Russia totalled 544,637 tonnes; in 2014, Russian Customs reported the total had plummeted to 22,280 tonnes. But that number is not the real one. Reproduced by the US Department of Agriculture. In practice, apple sales in Russia, along with apple imports, had begun to drop in 2013 and 2014, before the August embargo was imposed. The table shows the fall in imports by volume was 10% between 2012 and 2013; then almost 33% between 2013 and 2014. What has been happening since then is far from clear; the accounts from industry experts, grower representatives, state statistics, and think-tanks conflict with one another. A report from the Agro Business Centre (AB Centre) in Moscow suggests that total imported apple volume reached a peak of 1.21 million tonnes in 2010. This dropped to 1.19 million tonnes in 2011; recovered to 1.32 million tonnes in 2012; and then peaked anew at 1.4 million tonnes in 2013. In 2014 the apple import volume was down by 20% to 1.13 million tonnes. The AB Centre version is that Polish exports to Russia topped at 705,600 tonnes in 2013 – exactly 50% of the aggregate for all imports. Total declared value that year, $812.9 million; the Polish share, $409 million. Between 2014 and 2015, the total tonnage imported dropped to about 500,000 tonnes, a decline of 39%; that’s according to Sergei Korolev, President of the National Union of Vegetable Producers. But Korolev’s numbers aren’t confirmed by other experts cited in the same report in March. Igor Muhanin, President of the Association of Fruit and Berry Producers (ASPRUS), told Vzglyad the 2016 results indicate 1.38 million tonnes of apples were imported; 1.9 million tonnes were consumed; 760,000 tonnes were produced in domestic orchards, of which 500,000 tonnes went to processing factories for juicing and canning. The combination of rising apple prices and falling Russian consumer incomes has been the biggest factor in the decline of both imports and apple sales in the Russian market, industry sources acknowledge. The chart indicates that since 2013 the price of apples per kilogramme is up 30%. This is far from the worst of the foodstuff inflation recorded. The sanctions reduced overall imports by a smaller than expected margin, then rerouted them, so that Polish sales to Russia and deliveries across the border have continued. But instead of direct deliveries from Poland the apples travelled circuitously – through Belarus, Serbia, Moldova, Macedonia, Azerbaijan and other countries. False papers of origin or dual certification have been used to disguise Poland as the source. Because Belarus and Russia are members of a common customs union, Belarus cargo shipments across the border can avoid regular customs checks, so smuggling through Belarus was the first thing Polish shippers, Russian importers and Belarussian intermediaries thought of doing. How much of the Polish apple shipments arriving in Russia goes physically to Serbia and Moldova, and then back to Russia, or at dark of night through Belarus with false papers as disguise, isn’t known. Because the volume of smuggling of sanctioned foodstuffs – not just of Polish apples – has accelerated, flying squads of customs and Rosselkhoznadzor (the Federal Service for Veterinary and Phytosanitary Surveillance, RSN) agents have been despatched to intercept them. But the tonnage of contraband cargoes far exceeds the capacity of the authorities to intercept it. Instead, RSN issued a press release calling on “the Serbian accredited body to carry out consultations and to provide information on apple production in Serbia and re-export of apples produced in third countries.” RSN chief Sergei Dankvert announced sharper measures against Belarus and Moldova. Medvedev’s warning against “speculative profits” has turned out to be on the mark, but less so, his action to enforce it. Left: Crimea’s agriculture minister Vitaly Polishchuk with Prime Minister Medvedev at the Yarosvit Agricultural Enterrpise in Crimea, April 27, 2015. Right: Medvedev at Sad Gigant, the largest apple-grower in Russia, in Ingushetia on October 21, 2016. Russian consumption of Polish apples hasn’t suffered from the embargo by as much as planned in Moscow or forecast in Warsaw. This year apple industry experts expect the volume of imports from Polish orchards will be roughly the same as it was before Sikorski started giving the apples away. The reason is that sanctions-busting of the Polish apple trade has been flourishing for the benefit of the Russian apple industry as much as the Polish producers. That’s the combination of the Polish apple scam and the Russian apple scam. Together, they are restoring Polish apple-grower incomes, and adding to the incomes of an intermediary industry for smuggling the contraband fruit; constructing new smugglers’ roads and other infrastructure in the Russian-Belarus frontier region; adding pay for night-time truckers and bribes to Russian Customs inspectors. By adding to the price of apples on Russian supermarket shelves, the two scams are increasing protection for domestic apple-growers to plant costly new orchards and plan on delivering more fruit. The largest apple-growing farms, in league with federal and regional government officials, are scooping up the lion’s share of state budget funding for new orchard planting and cool storages for the apple harvest to come. For the time being, the agro-industry businesses of established oligarchs like Oleg Deripaska (Kuban Agro) and Vadim Moshkovich (RusAgro) say they are not growing apples commercially on their farms. Gennady Timchenko is reported to be a substantial stakeholder in Alma Holding, a Krasnodar apple-grower, but he doesn’t make it into the top-20 largest orchardists in the country. 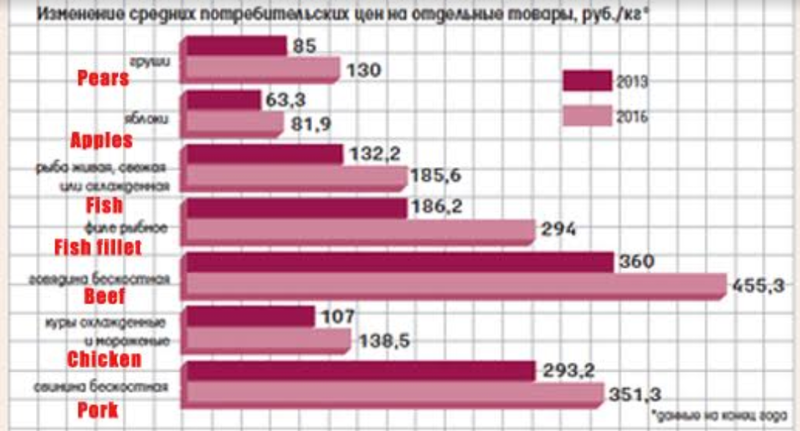 According to Muhanin, the top-5 apple-growers in Russia at present are Sad Gigant (“Giant Garden”), Agronomist (Lipetsk), Agronomist (Krasnodar), Central Chernozem Fruit and Berry Company (CCPAC of Voronezh), and Gardens of Pridonya. These remain relatively small in plantation area, fruit output, and market share. The biggest of the apple oligarchs is Bekhan Hamchiev (pictured below, left). He controls Sad Gigant in Ingushetia through a Moscow company called Service Plus. Sad Gigant says it will produce 12,000 tonnes of apples this year, compared to 7,000 tonnes in 2016. Yury Zamyatin (centre) controls CCPAC, while Andrei Samokhin (right) controls the fifth ranked Gardens of Pridonya. At present, says Muhanin, the Agriculture Ministry is providing a subsidy payment to apple growers for planting new orchards and equipping them for higher yields of Rb236,000 ($4,140) per hectare. The experts say this represents between 10% and 25% of the costs of planting and equipping new high-yield apple orchards. That’s more optimistic than anyone else in the industry will acknowledge. According to the USDA report, issued at the end of 2015, the growth of Russian production will be small, at least for the next couple of years – “a modest 2 percent to 1.3 million tons on favorable growing conditions. This includes a 4-percent increase in commercial production to 572,000 tons, which accounts for near 40 percent of total production.” But USDA has been predicting imports would drop below 800,000 tonnes. Polish and Russian ingenuity have proved the Americans wrong. A report by Agro-Investor, published in Moscow last October, estimated that Russian apple consumption came to 2.5 million tonnes in 2016, about 100,000 tonnes (4%) more than 2015. By 2020 the forecast is for consumption of 3 million tonnes; this represents an annual rate of growth of 4%. By then, the report quotes Korolev as predicting the volume of domestic production will have jumped; less than 10% of consumption will come from imports, he says. This year, comments Irina Koziy, chief executive of Fruit News, production gains have been set back by late frosts and heavy rains. The rate of growth of both domestic production and imports will depend, claims a report in April by BusinesStat, a Moscow consultancy, not on the effectiveness of sanctions, nor on the increase in state and commercial investment in orchards, but on the recovery of Russian consumer incomes and demand. The new Russian apple business is also an open secret which noone in the business will agree to discuss, not even off the record. Polish and Russian press reports indicate the cost of fabricating false cargo papers and moving a lorry-load of Polish apples to the Russian border is about €500 (about $600). The additional costs of delivering the apples through the frontier to the cool store or wholesale distribution point may be $200 to $400 per 20-tonne truck. In addition to the top-5 producers named by Muhanin, BusinesStat identifies another 15 for the top-20. 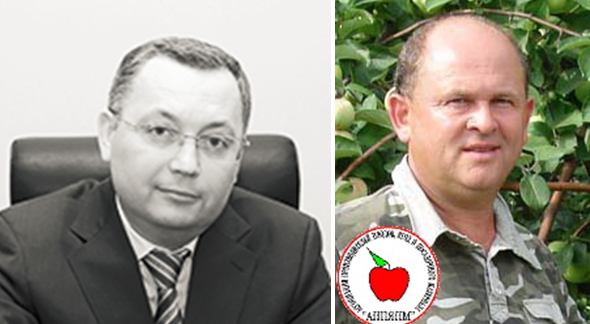 Each of them was contacted and asked: Who are the major producers of apples in Russia? To what extent do they depend on state grants and loans for their business development? Is private investment increasing and by how much? How do they assess the dependence on imports of the Russian apple market this year, compared to the pre-sanctions period? Off the record, they were also asked to say why there is still smuggling of Polish apples through Belarus? Not one of the top-20 answered. In the meantime, what the reports and industry organs aren’t saying is that the new phase of Russian apple business is operating corruptly at the border and expensively in the interior; it is also generating benefits for almost everybody – Poles, Belarusians, Russians. That is except for Sikorski and Applebaum, whose idea of what’s good for Poland is ignorant of the commerce, and for Russians irrelevant. The other exception is those Russian apple-eaters who don’t have the income to afford the new apple price and lack a dacha orchard to grow their own. Russian gardeners, planting and harvesting from home or dacha orchards, are advised in dozens of publications on growing techniques and cultivars best suited to regional soil, pest control, and weather conditions. Click to open. Soviet botanists reported that the domestic apple evolved from a species of wild apple native to southern Kazakhstan. The Antonovka (left) has been a traditional Russian variety since the 17th century, and its hardy rootstock often grafted with newer types. Right, the Bashkir, a variety that is also hardy in frost. For the time being, about one-third of Russian grown apples are cultivated in the agricultural enterprises. The rest are grown by households for family consumption or sales from roadside stalls, and in informal outdoor markets during the season. Their quality is more variable than the commercial fruit, but their price has been pushed upward as the volume of imports returns to earlier levels. What is happening, industry observers admit reluctantly, is that because of rising prices, fewer people can afford to eat apples, but more state money is going into commercial orchard production. That money disappears faster than new apples appear on the market at a price Russians can afford.